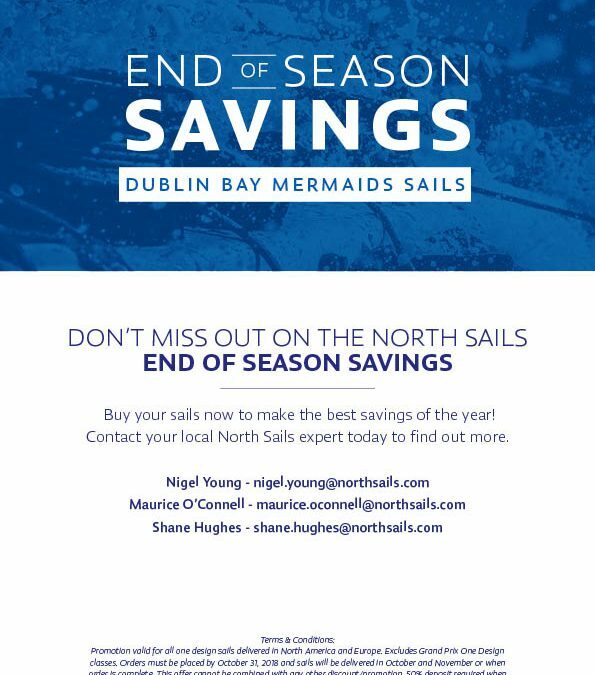 North Sails are currently running an ‘End of Season’ promotional deal for the month of October on Dublin Bay Mermaid Sails. Get your order in before the 31st of October for your new 2019 sails to get the best discount possible. For further information don’t hesitate to contact your North Sails Mermaid rep Nigel Young (nigel.young@northsails.com). For more information on the newly designed sails which helped Darragh Mc Cormack to win his National title this year check out the following article: https://northsails.com/sailing/en/loft-news/a-sail-making-fairytale-involving-mermaids?fbclid=IwAR24Lzk4vwVvwx7OO_xtYTOujVeSQGdeYmI-TP2-ZEz-5_fXe061B2oHBx0. Thank you to North Sails for their continued support and sponsorship of the Dublin Bay Mermaid class.